This dessert takes classic chocolate covered strawberries to the next level. Strawberries are dunked in melted chocolate and filled with a creamy cheesecake filling. For an extra decadent treat, make a double batch of the cheesecake filling and use it for a dip for the finished strawberries. Chocolate chip cookies are a classic dessert because of their rich, chocolate flavor. These cookies offer a slight variation that is even more delicious than the original! Caramel popcorn is mixed into chocolate chip cookie dough and baked in the oven to perfection. For an even richer chocolate dessert, substitute chocolate popcorn for the caramel popcorn. Now that the weather has gotten much colder, hot chocolate is a favorite beverage. Whether you prefer something classic, such hot chocolate made from milk chocolate, or something a little more unique, there is something for you. 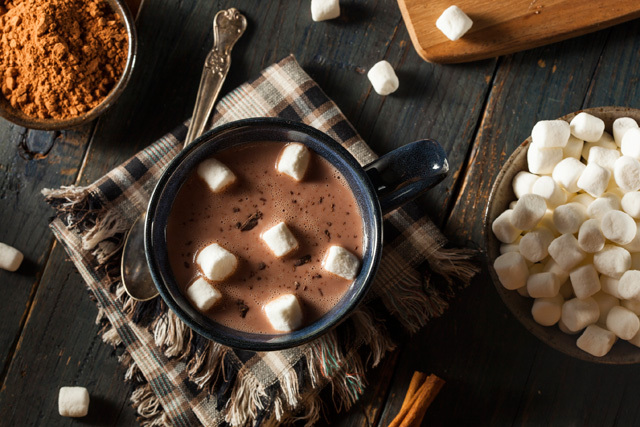 The next time you want to drink hot chocolate, try one of these recipes. By the time National Chocolate Day comes around, the last of the pumpkin harvest will still be available. This means that it’s time to find new ways to cook with it! These pumpkin bars are made even better with the addition of chocolate chips! They’re the perfect seasonal treat! Chocolate is delicious, but let’s face it, recipes can be a little too decadent. If you want to enjoy chocolate on November 29 without the guilt, try these low fat blueberry brownies! They’re not only lower in fat and calories than regular brownies, but they include blueberries, which are rich in antioxidants. Garnish them with fresh blueberries right after coming out of the oven for an even healthier treat. If you’ve been itching to dust off your fondue pot, National Chocolate Day is a good time! Invite a few of your friends over for a chocolate fondue party. If you really want to show them a good time, include several different types of chocolate fondue, such as milk chocolate and dark chocolate, as well as a variety of fondue dippers. These popcorn chocolate truffles are a perfect treat if you’re craving something a little crunchy. These truffles are made by forming small balls out of popcorn and then dunking them in melted chocolate. If you’re also craving the salty and sweet combination of flavors, consider salting your popcorn before following the rest of the recipe. These chocolate treats are just perfect for National Chocolate Day! If you’re looking for other ways to celebrate, consider buying someone special one of our delicious chocolate gift baskets.